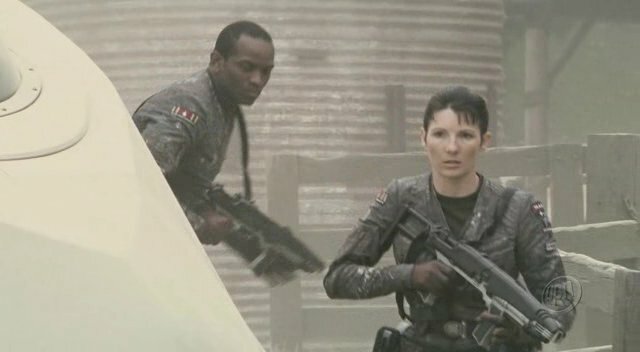 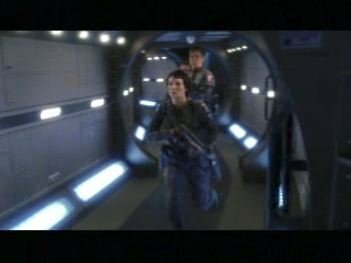 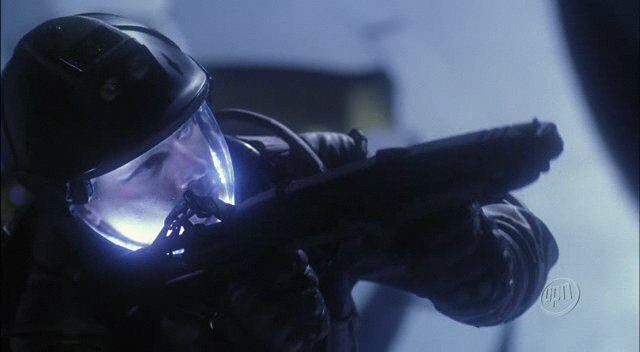 Pulse rifle carried by Earth's Military Assault Command Operations troops assigned to the starship Enterprise on her expedition into the Delphic Expanse in 2153. 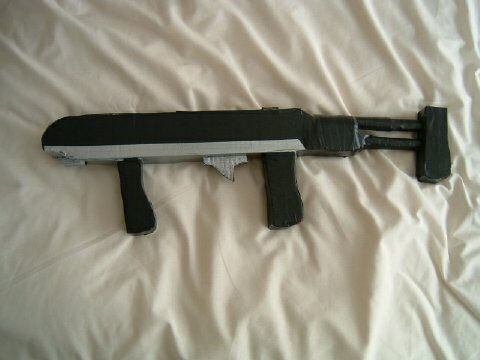 A sniper version also exists, with a longer barrel. 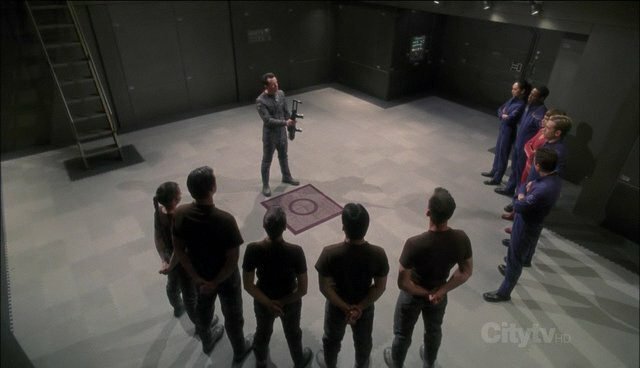 Also, take a look at our new MACO website in which I attempt to identify all the MACOs we've seen on the show! 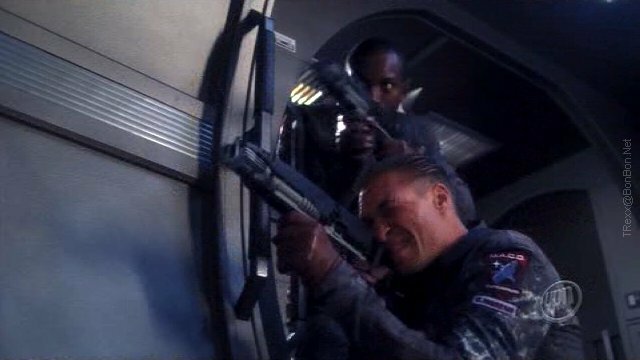 Not - so far as we know, at the moment - the much-anticipated Phase Rifle, it seems, but a whole new weapon as carried by the new Starfleet commandoes, the MACO. 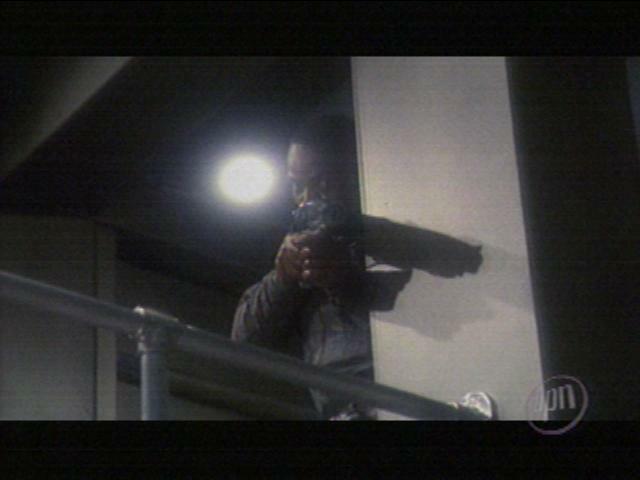 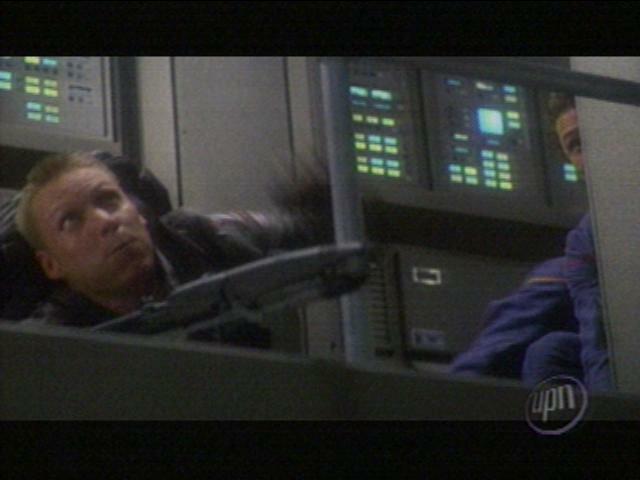 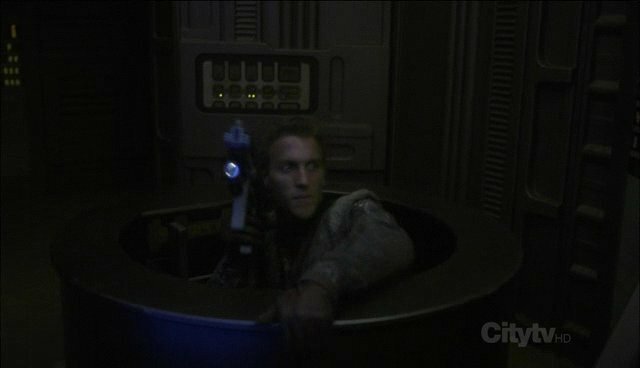 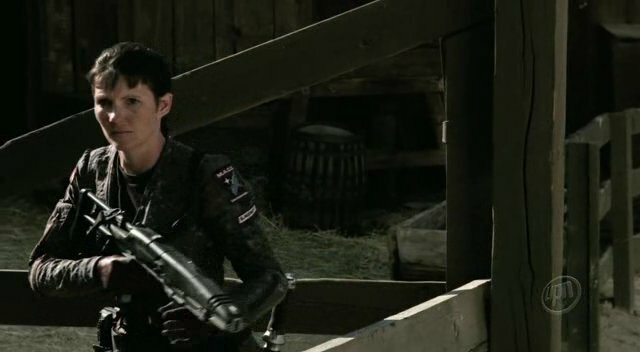 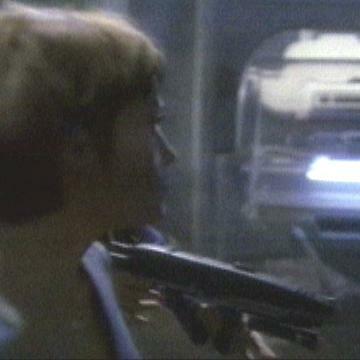 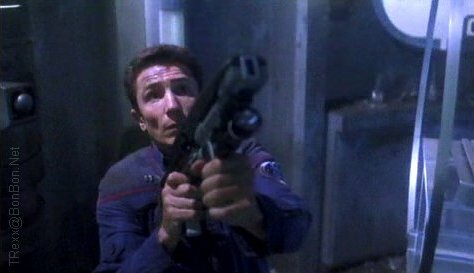 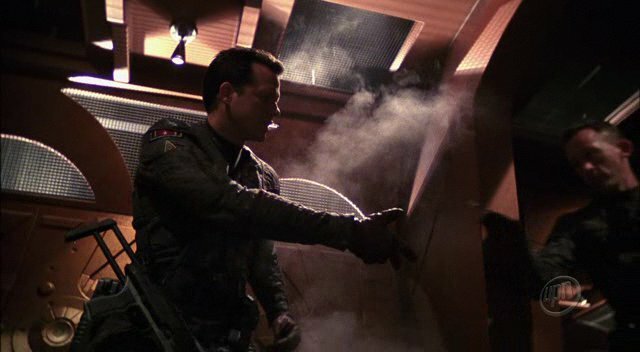 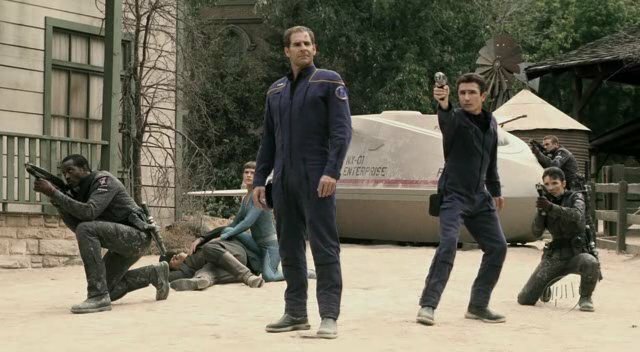 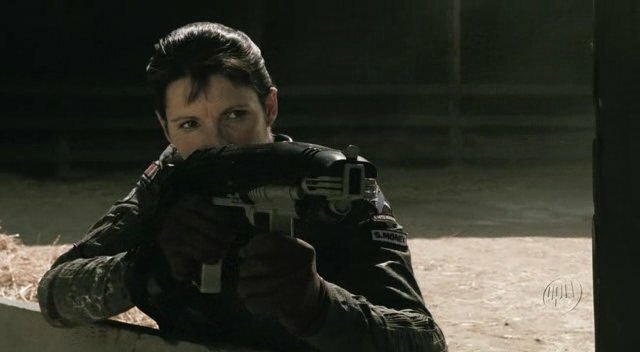 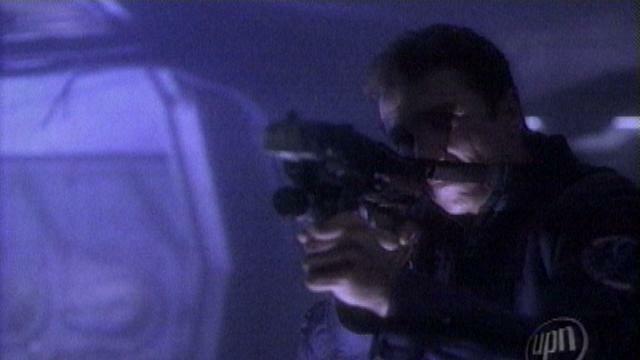 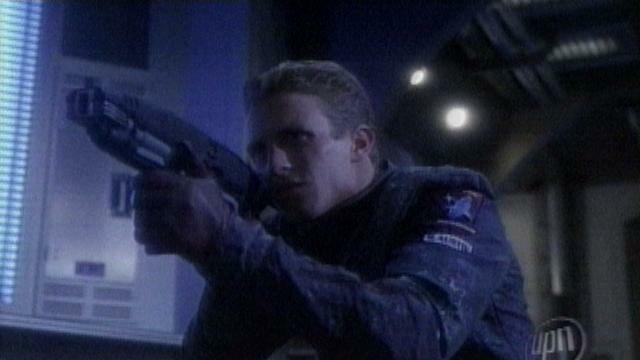 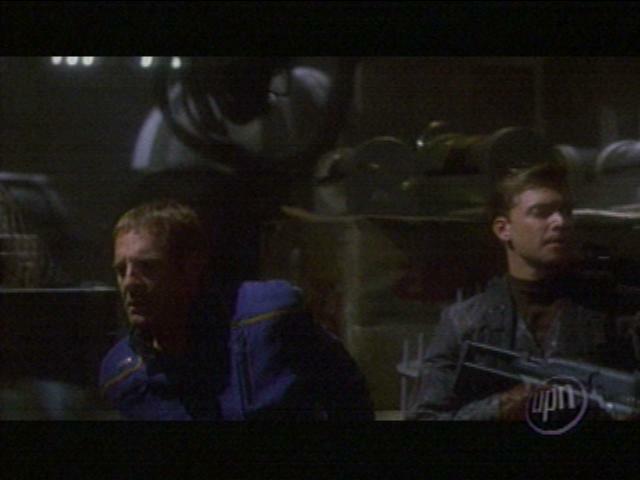 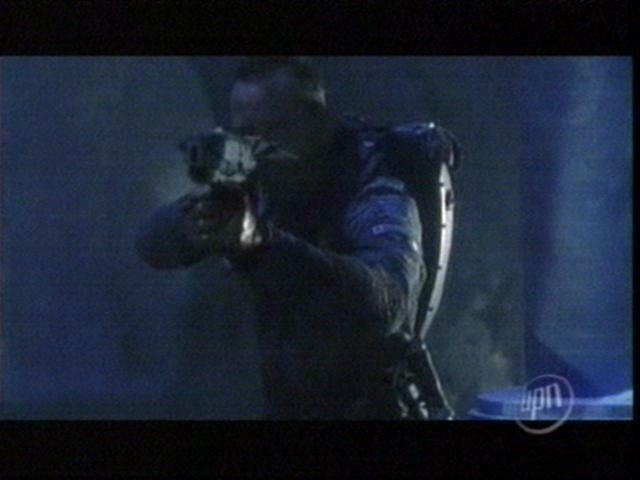 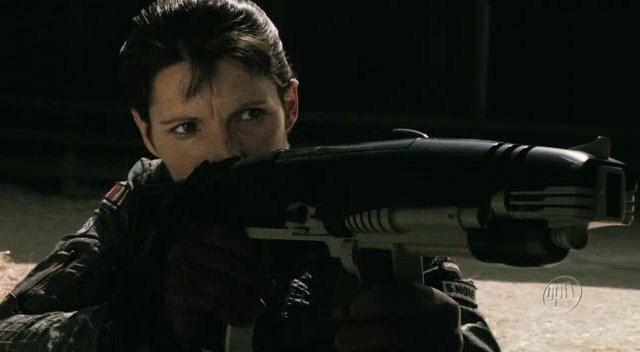 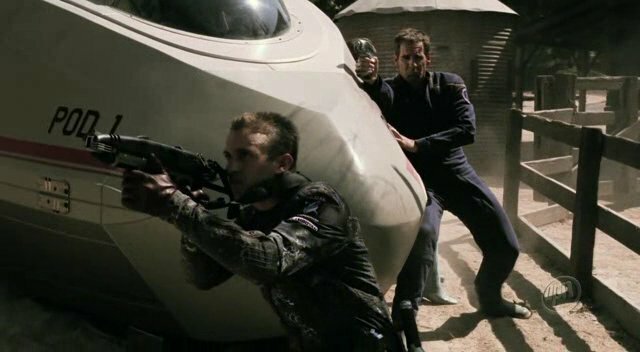 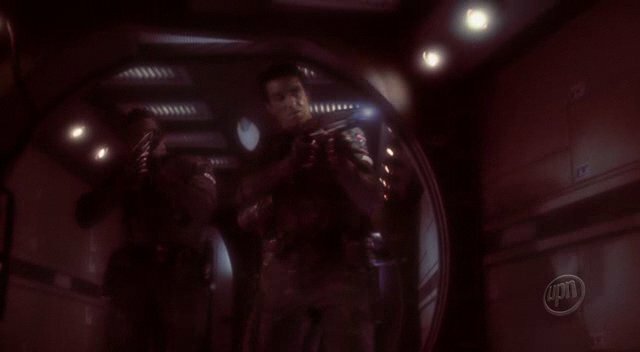 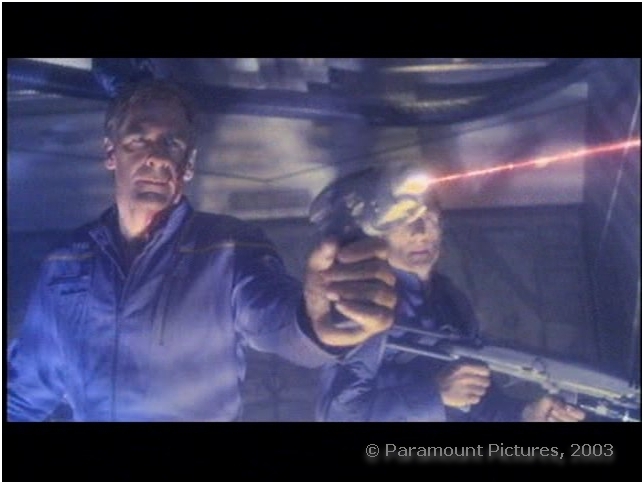 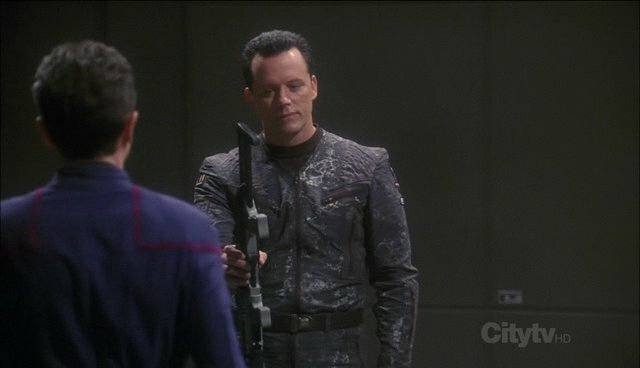 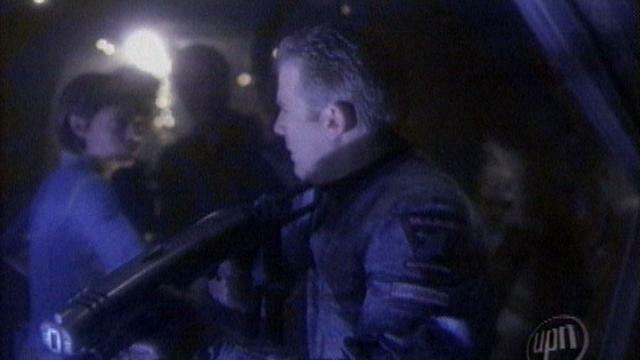 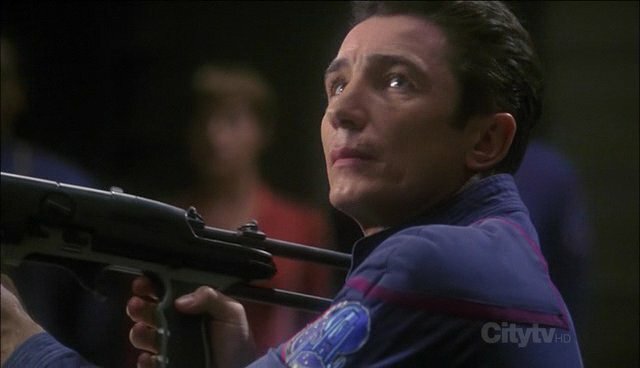 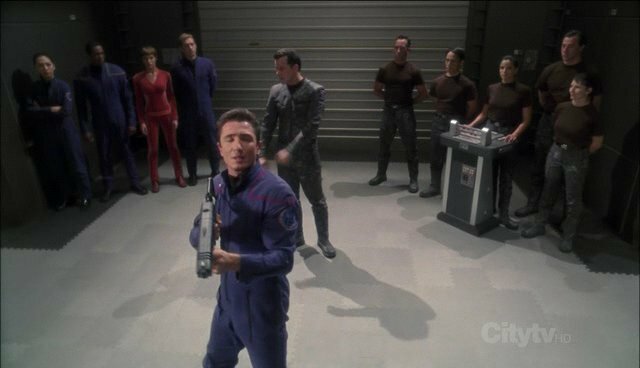 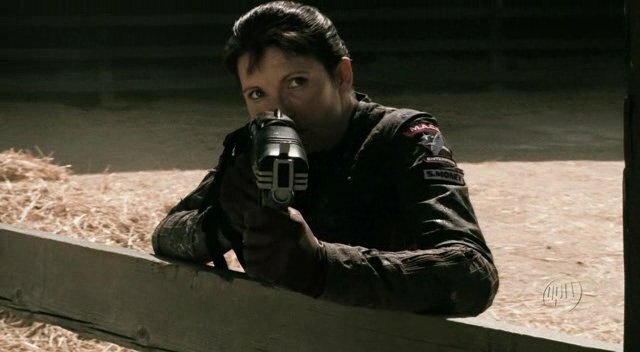 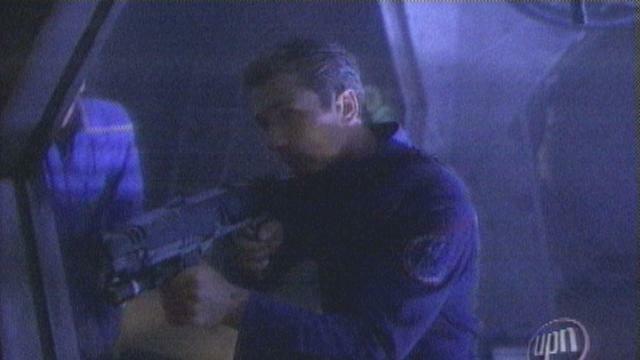 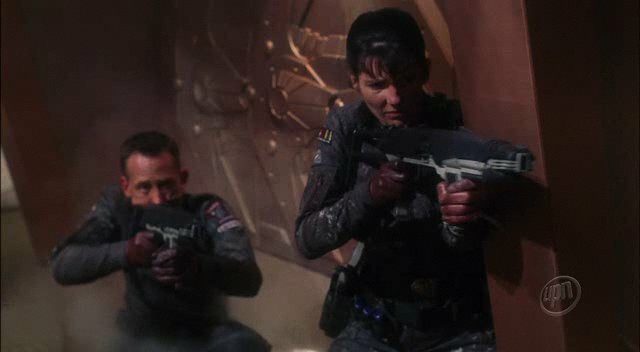 Of course, given the show's tendency to recycle previously-used props (for instance, the MACO sidearms, EM-33s, were seen as alien weapons in a season two episode) 'new' may not be the correct term; already one person has noted their similarity to the Ferengi weapons from the episode "Acquisition;" but since I haven't seen it I'm reserving judgement for now. 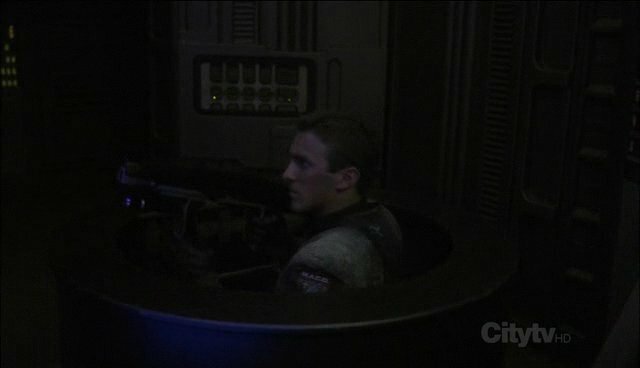 No-one who has can confirm that either. 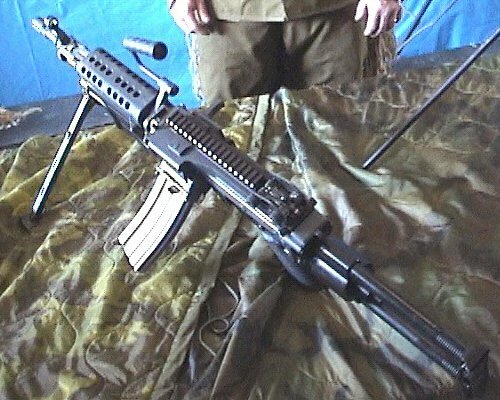 The weapon has many characteristics in common with the EM-33, especially the muzzle and the assembly above the barrel. 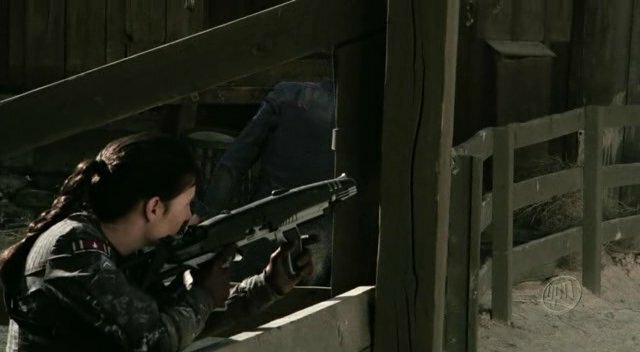 There's a pop-up scope, initially seen on the sniper-rifle variant, but common to both versions. 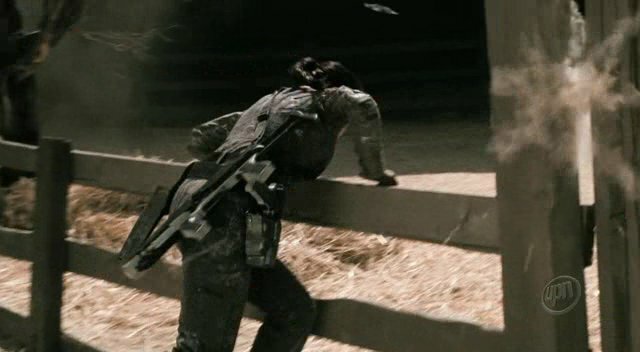 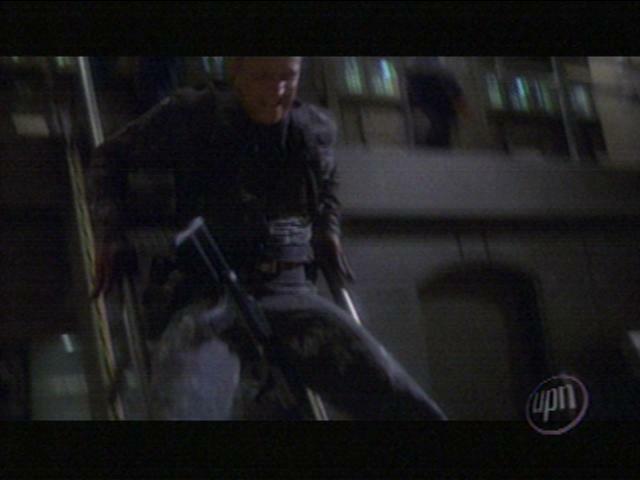 The stock reminds me of something, some old projectile weapon like the US M1A1 papatrooper carbine, or even the paratrooper stock found on some variants of the M249 SAW; There's still a chance that, as with the EM-33, this weapon may be inspired by some older gun - if anybody figures it out, let me know! 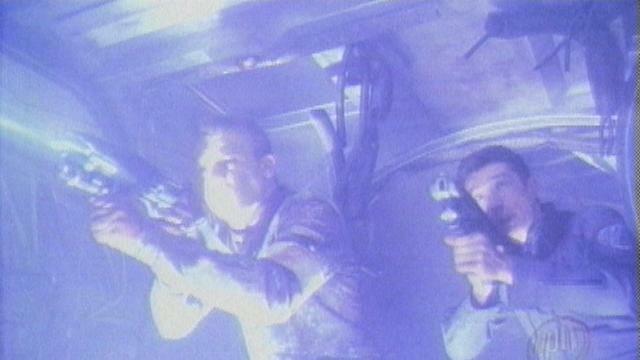 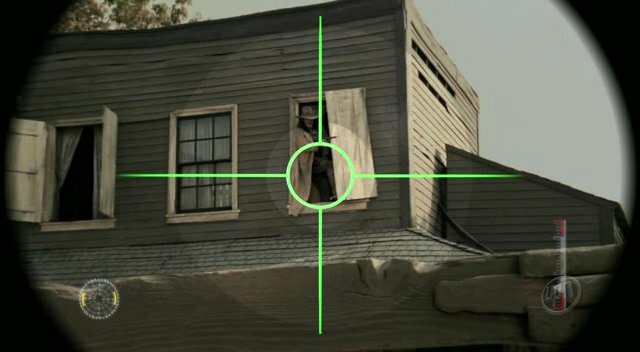 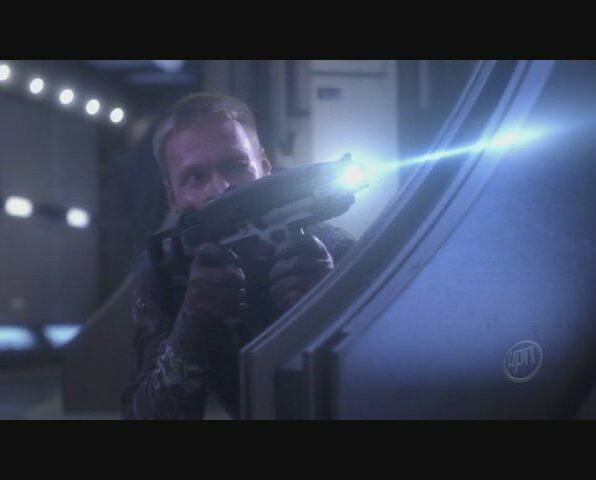 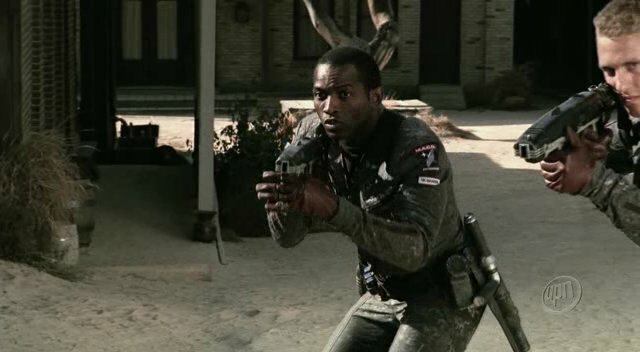 There's already another variant seen used, in "Impulse" and "Damage" - featuring an under-barrel flashlight, visible in the caps below (especially the side-view, and one showing a definite torch lens) - yet at no point in these episodes are they switched on! 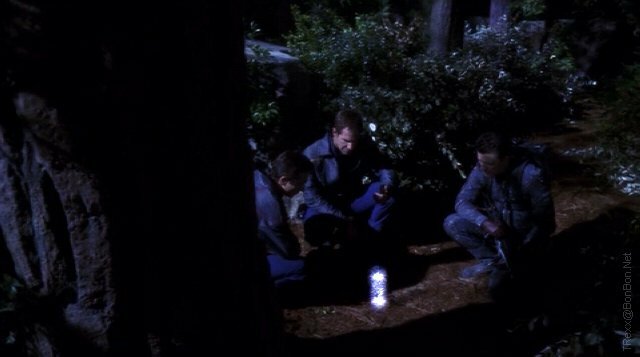 I'm guessing that maybe whatever lighting effect they were hoping to get from them didn't work, or screwed up the lighting on the sets. 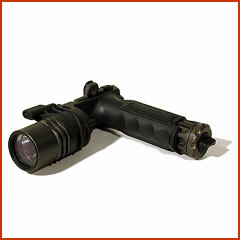 . . Luke Sollitt contacted me to suggest the whole foregrip had been replaced by a Surefire M900A vertical foregrip light, but it's plain this isn't the case. 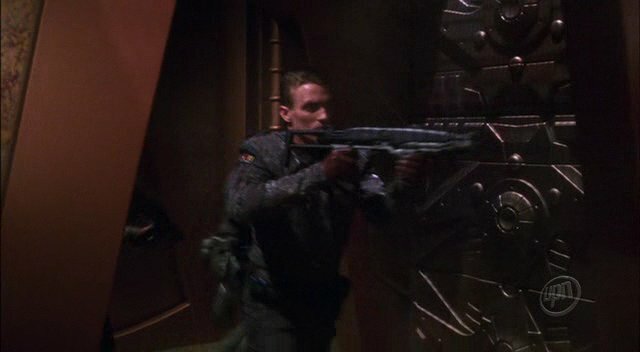 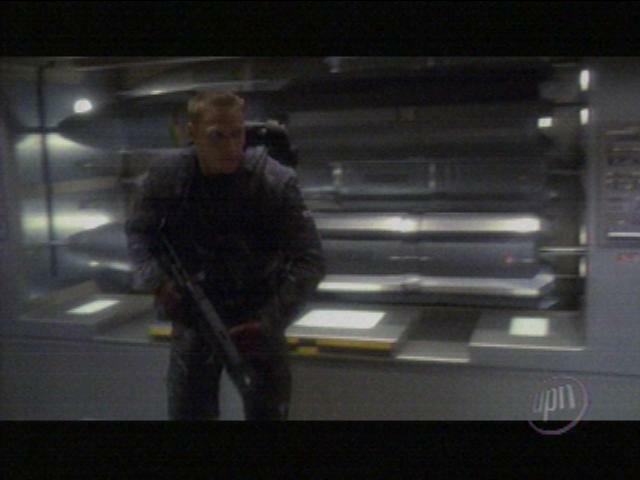 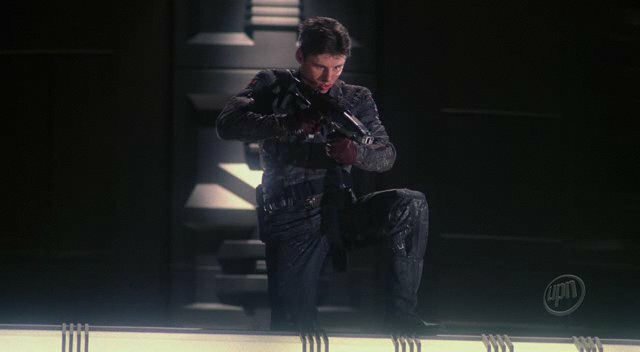 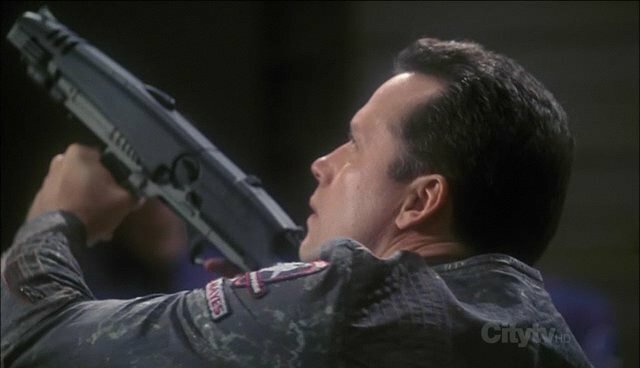 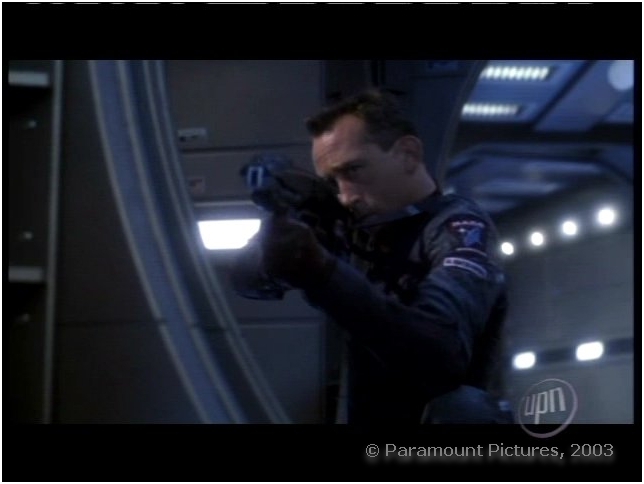 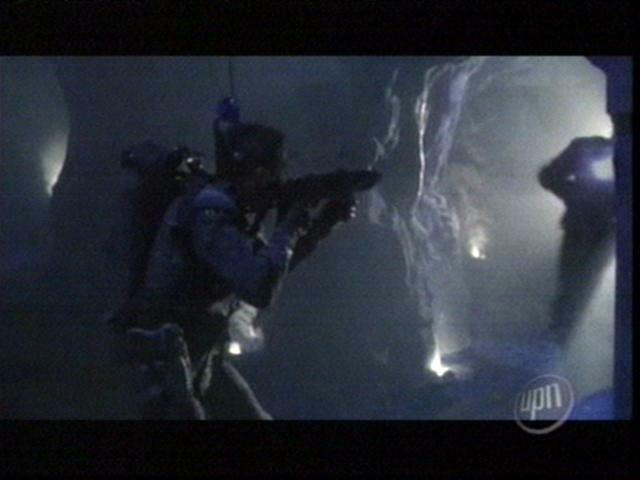 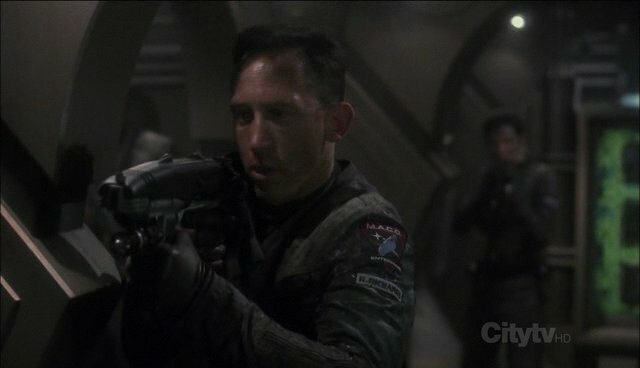 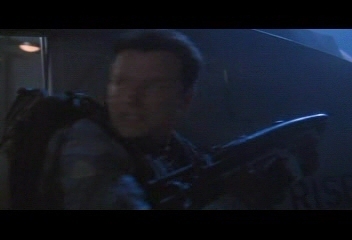 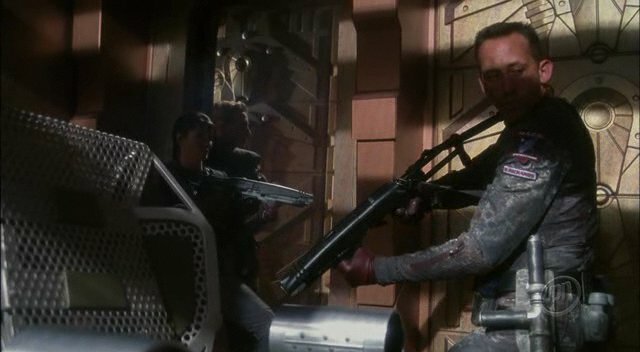 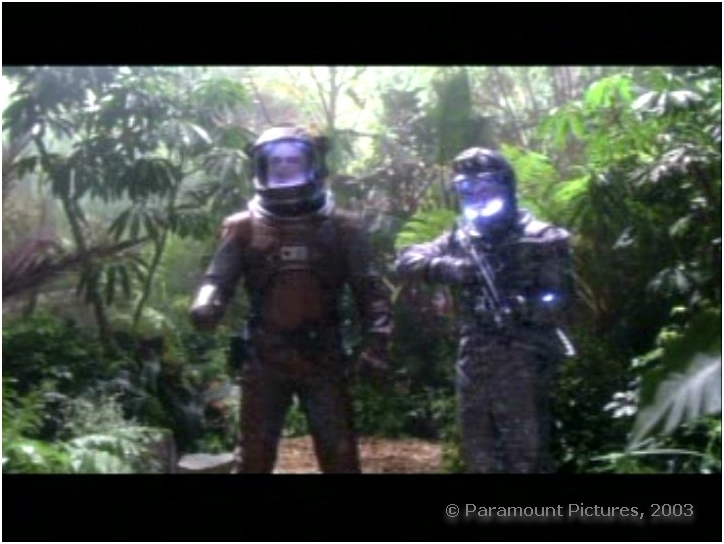 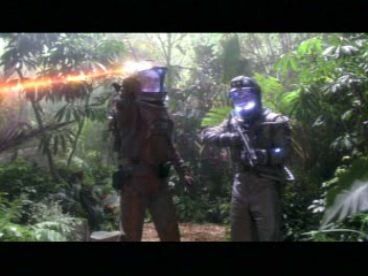 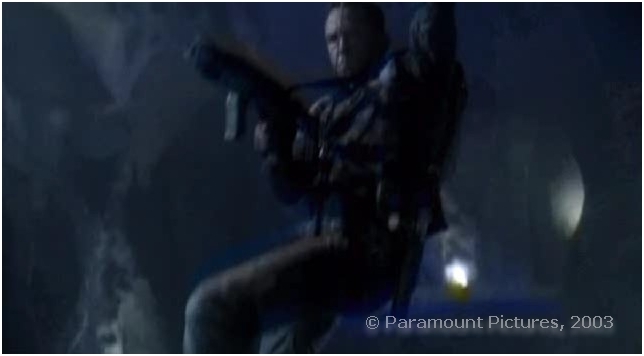 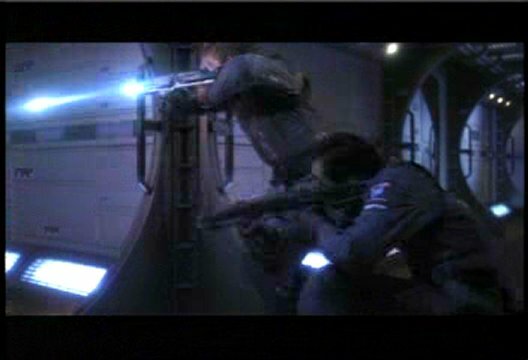 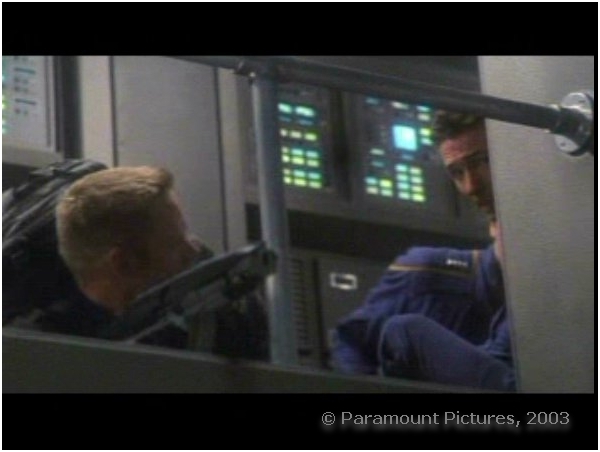 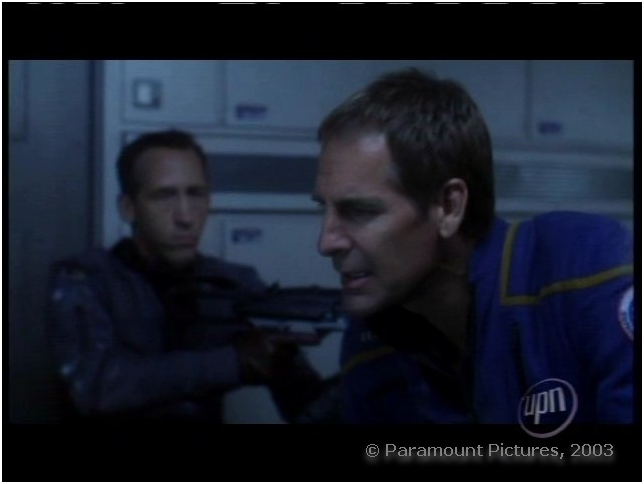 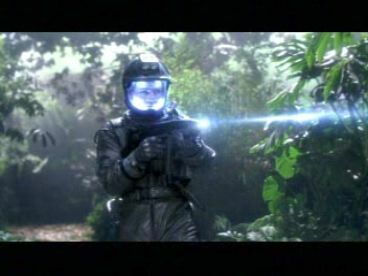 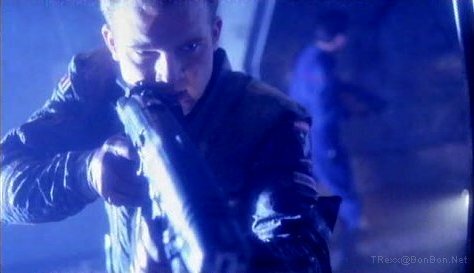 He's also mentioned, as has Sebastian Prooth, some similarities between the MACO rifle and the EVA Rifle from Star Trek: First Contact, but this image shows the resemblance is slight. 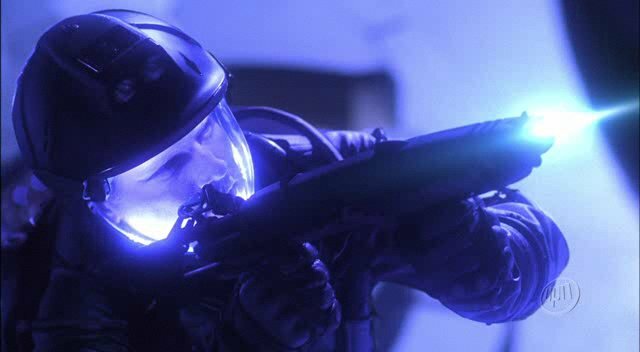 Of great interest is the stun setting these weapons are said to have. 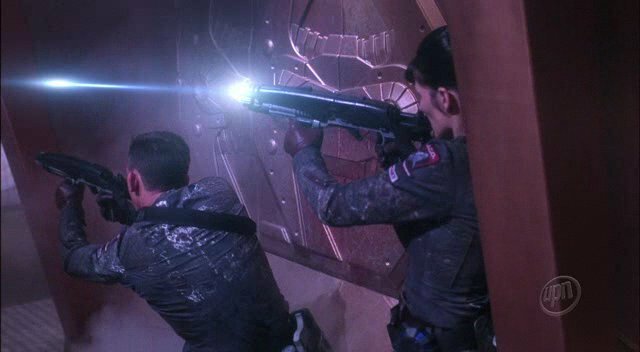 How does a plasma rifle stun? 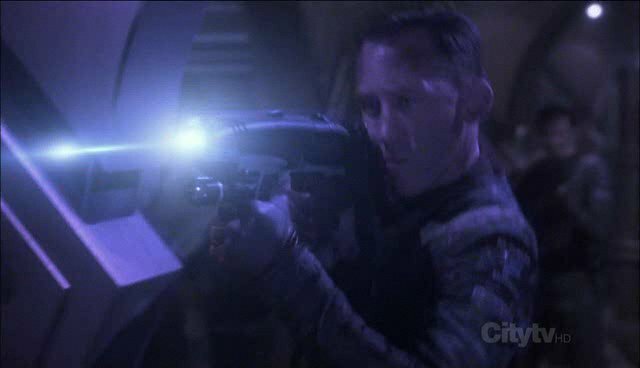 That's not to say it is a plasma rifle of course. 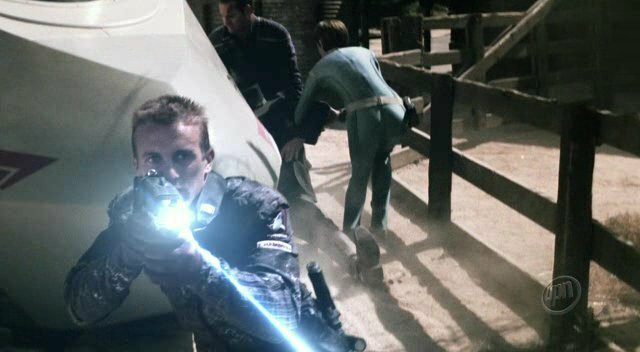 And the blue pulses they fire have been likened to those of the Vulcan weapons in "Shadows of P'Jem." 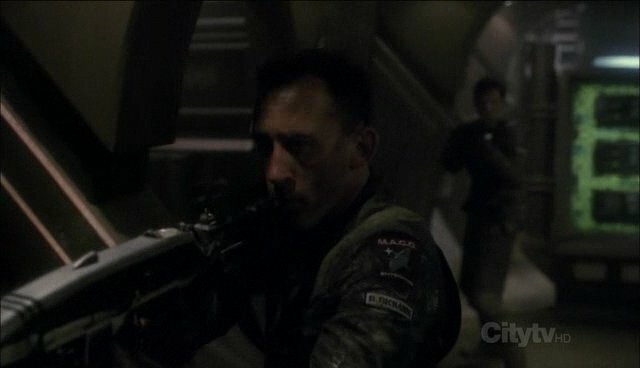 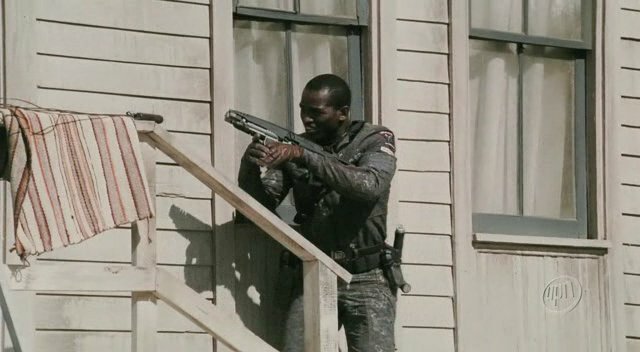 Is it too much of a leap to suggest Vulcan weapons tech would be more advanced than that of Earth, and that the MACO rifles work on the same principles as the Vulcan ones? 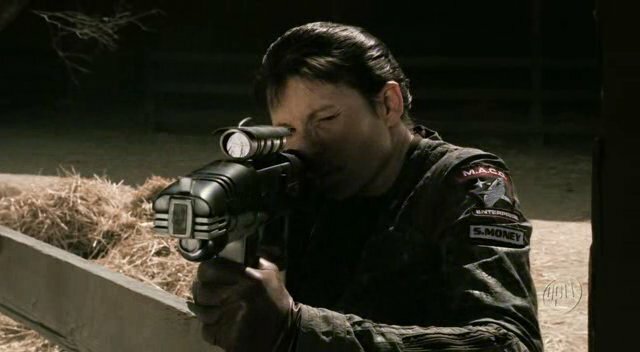 Furthermore, we find in "Zero Hour" that the rifles' output frequencies can be altered, as Phlox orders them switched to 32.6 teracycles. 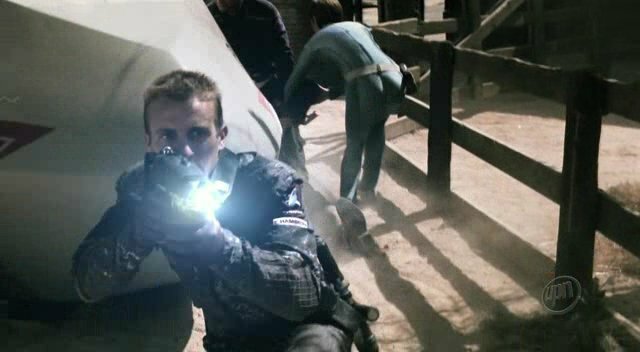 Matthew Barlow says: "I'd speculate that a plasma weapon would cause injuries through a combination of kinetic and thermal effects (imagine being hit by a bullet and a blow torch at the same time - nasty!). 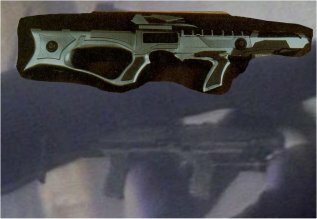 To create a stunning weapon these would have to be reduced. 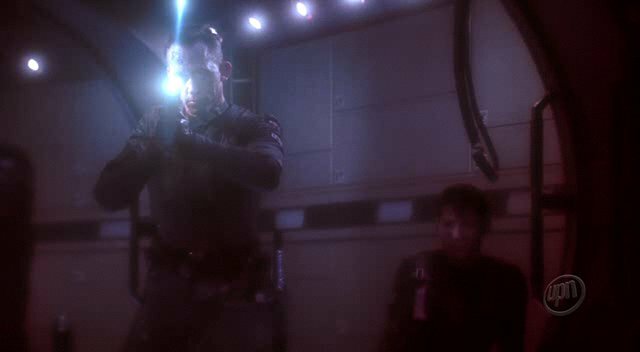 It is possible to generate (relatively) low-temperature plasma - such as in those plasma-ball lights - which would deal with the thermal effects. 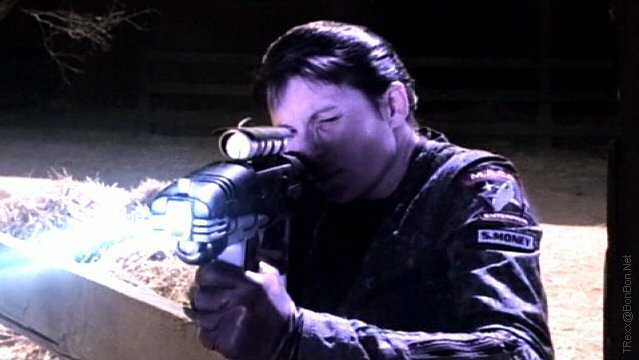 Reducing the velocity of discharge would lessen the impact, at the expense of range and accuracy. 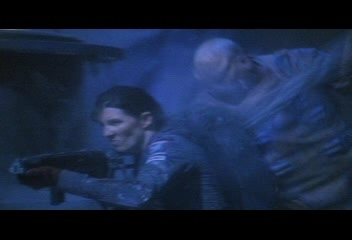 Alternatively. 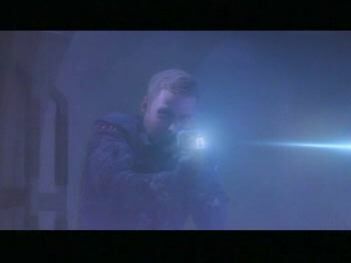 the plasma bolt itself could be made more diffuse, spreading the impact over a wider area. 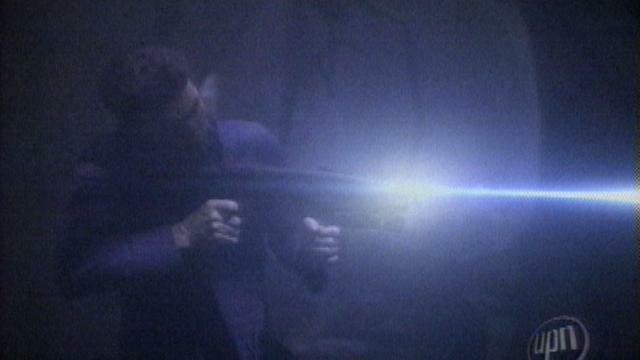 The effect would thus be more akin to a 'baton round' or 'rubber bullet' than to a regular round. 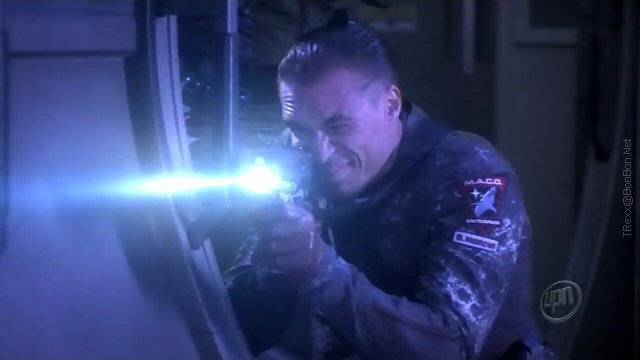 Whilst reducing the lethality of the weapon, this isn't really a 'stun' setting. 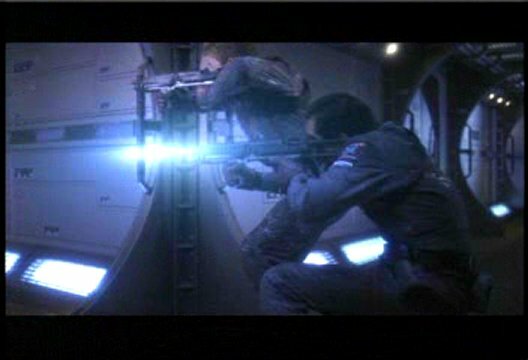 However, if it were possible to give the bolt a powerful electrostatic charge, then this might discharge into the target on impact (Star Trek science!). 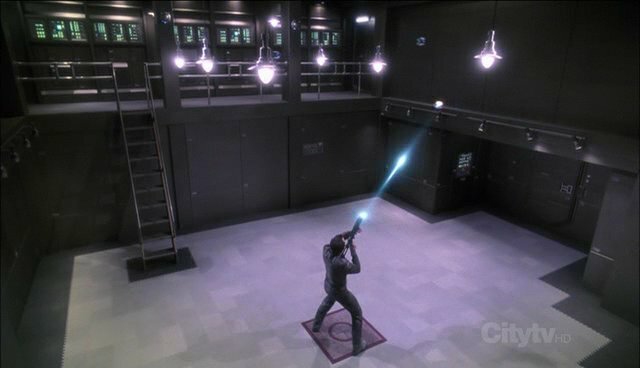 The bolt might then have an effect akin to the modern day taser, using electricity at the appropiate frequency to knock someone out. 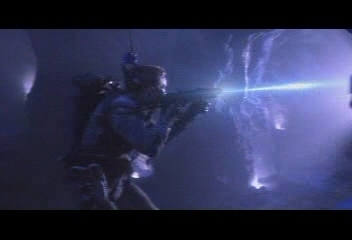 It also occurs to me that it may be possible to add lethal electrostatic charges to plasma, to improve effectiveness still further. 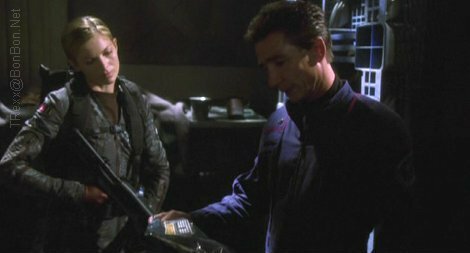 This might be a new development, which would explain comments about the MACO's equipment being two years ahead of Starfleet's. 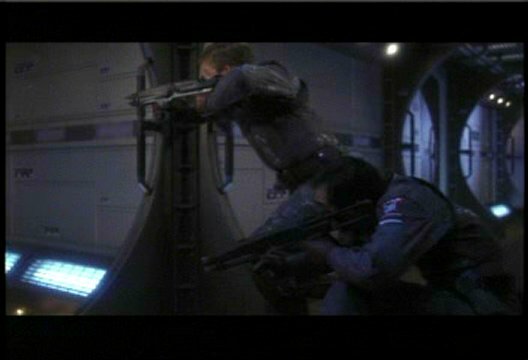 It might also explain how MACO's are able to change the frequency on their rifles."